I’m not all that shocked really, as I tend to go through these phases every now and then. Sometimes it’s boycotting meat, maybe sugar, and then I go back to being normal again (whatever that is). I’ve learned to just give in to these cravings and I feel much better when I do. It’s my body’s way of balancing. Currently, I’m into rice and beans. Last week we spoke about budget meals, and this recipe is a continuation of that theme. 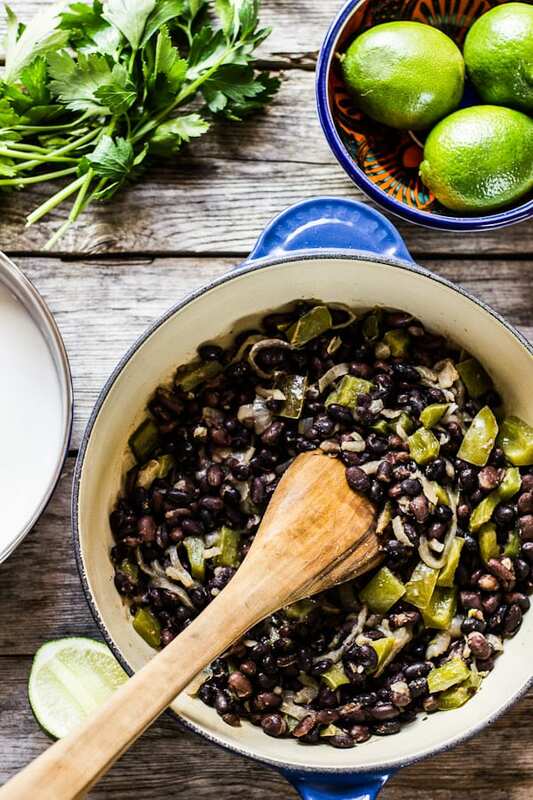 Whether you make a big pot yourself or use canned as I’ve done here, incorporating beans into your diet is an excellent source of (inexpensive) plant-based protein. 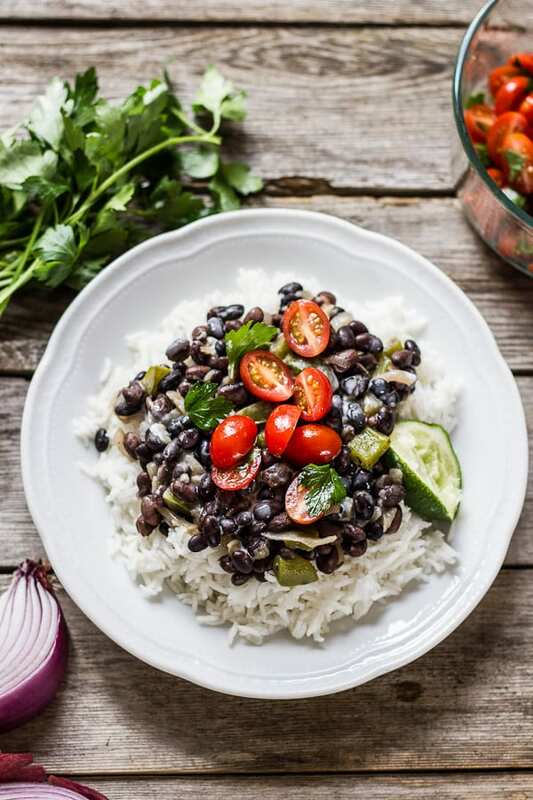 The best way to describe this dish is ‘black beans meets the islands.’ It was inspired by the lovely vegetarian creations over at Fare Isle. To make this, I sauté red onion and bell pepper with a hint of cumin. I add the beans, and gently simmer with stock. It’s served on a bed of basmati rice and topped with juicy grape tomatoes and avocado. For extra flavor, I quickly marinate the tomatoes in olive oil, salt, and herbs while preparing the rest of the ingredients. The tomatoes create this incredible juice that adds just the right amount of acidity to this dish. I finish with a drizzle of thick coconut cream for a little island flare. Pure heaven. You know what else would make this nice and island-y? One of these… I can never say no to a margarita. This whole vegetarian thing is going to suit me quite well. It falls right in line with my current cravings and the topic of budget meals. Plus, if margaritas are vegetarian friendly I might need a few after all of this packing- oh the joys of moving! And while we’re at it, happy Cinco de Mayo, friends! What’s the difference between coconut milk and coconut cream? Coconut milk is thin in consistency and is the base for most Asian-style curries. Coconut cream is a lot thicker and often used in desserts. Both versions are unsweetened. There is also ‘cream of coconut’ which is a sweetened version of coconut cream. I’m using regular coconut cream for this recipe for it’s thick, rich texture. *What's the difference between coconut milk and coconut cream? Coconut milk is thin in consistency and is the base for most Asian-style curries. Coconut cream is a lot thicker and often used in desserts. Both versions are unsweetened. There is also 'cream of coconut' which is a sweetened version of coconut cream. I'm using coconut cream for this recipe for it's thick, rich texture. Gently warm the coconut cream until it becomes liquid. Transfer to a bowl; it will slightly thicken again as it sits. Add the sliced tomatoes and herbs to a large bowl. Drizzle with olive oil, salt and pepper. Toss gently to combine. Allow the tomatoes to marinate while you prepare the rest of the dish. In a large skillet, warm a splash of olive oil over moderate heat. Add the onion, peppers and cumin. Saute until soft and golden, about 10-15 minutes. Add the stock and bring to a gentle simmer. Taste and season with extra salt and pepper as desired. To serve, portion the rice onto plates. Add the beans, and top with marinated tomatoes and any of their juices. 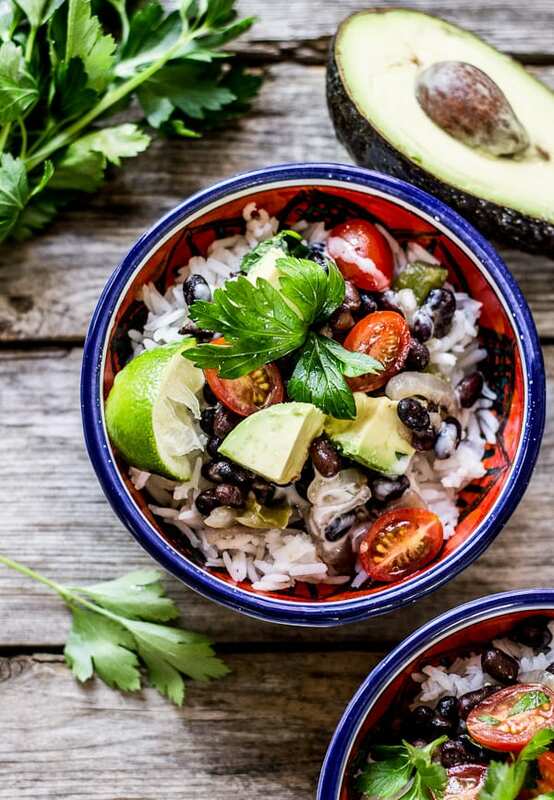 Garnish with chunks of avocado, cilantro, and drizzle with coconut cream. Serve with fresh lime wedges. This looks absolutely delish! I love black beans. I do believe our body’s talk to us if we are willing to listen — sometimes in whispers, eventually in screams ;-). I love the simplicity of this recipe and the wholesome ingredients you chose. I am absolutely struck by the lighting in your photos… did you take them outside? Just gorgeous! Ok…so where is the party? I’d take you up on a plate of this and one of those drinks ;) Coconut cream…be still my heart! Perfect for Cinco de Mayo! I’ve never seen coconut cream…I’ll have to look for it!! Thank you! The combination of flavors is lovely- it’s a little Spanish, a little tropical, and with some fresh lime juice everything all comes together. I hope you enjoy! This is absolutely heavenly – what a fantastic combination of flavors! Thank you so much for sharing this – I will use it for years to come! So simple, so amazing!! Pinned to try very soon :) Keep up the great work! Welcome Sara! 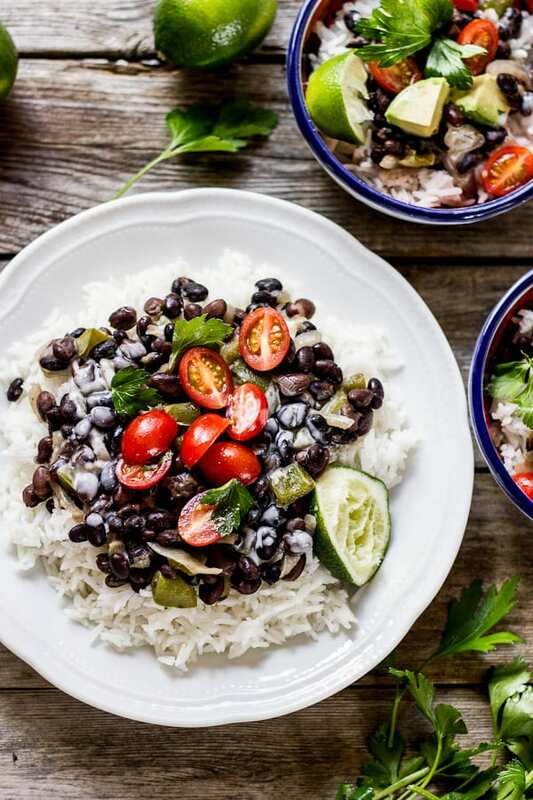 I love your blog name :) I hope you like the recipe- I’ve become quite addicted to beans and rice these days. It’s a healthy, comforting meal. Thanks for stopping by! This is just the ticket- my body has been screaming for veg lately, as well… must be that every part of me is ready for this winter to be over! Looking forward to making this for dinner tonight- going to do grilled pineapple instead of tomato. Cheers! Oh wow, grilled pineapple sounds amazing. I’m going to try that for sure. Thanks for the tip!